"International Space Station Live! (ISSLive!) is a Web application that uses a proprietary commercial technology called Lightstreamer to push data across the Internet using the standard http port (port 80). ISSLive! uses the push technology to display real-time telemetry and mission timeline data from the space station in any common Web browser or Internet-enabled mobile device. ISSLive! is designed to fill a unique niche in the education and outreach areas by providing access to real-time space station data without a physical presence in the mission control center. The technology conforms to Internet standards, supports the throughput needed for real-time space station data, and is flexible enough to work on a large number of Internet-enabled devices. ISSLive! consists of two custom components: (1) a series of data adapters that resides server-side in the mission control center at Johnson Space Center, and (2) a set of public html that renders the data pushed from the data adapters. A third component, the Lightstreamer server, is commercially available from a third party and acts as an intermediary between custom components (1) and (2). Lightstreamer also provides proprietary software libraries that are required to use the custom components. At the time of this reporting, this is the first usage of Web-based, push streaming technology in the aerospace industry." Navigate to Live Data, then choose Console Displays. What is a console display? "In the International Space Station (ISS) Mission Control Center, teams of experienced engineers and technicians, known as flight controllers, work 7 days a week, 24 hours a day, 365 days a year. Flight controllers sit at computer workstations, known as consoles. Each flight controller and their team are experts in their specific area. On top of each console is the "call sign" or abbreviated name for each console position. 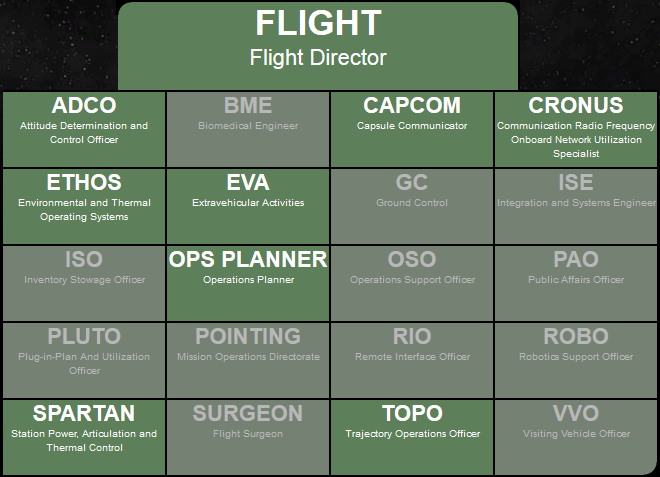 The name of the console position is based on the responsibilities of the flight controller. Flight controllers must keep a constant watch on the crew's activities, health, and safety. They also monitor the spacecraft equipment and software. On the ground, flight controllers must communicate with the other console positions and the flight director to ensure the success of the mission. The call signs for each console position in the ISS Mission Control Center are listed to the right. Select a console position to view the console displays, or graphical interface of the live data from the ISS. Console positions in gray are not actively receiving data." Now, choose any of the available console displays. 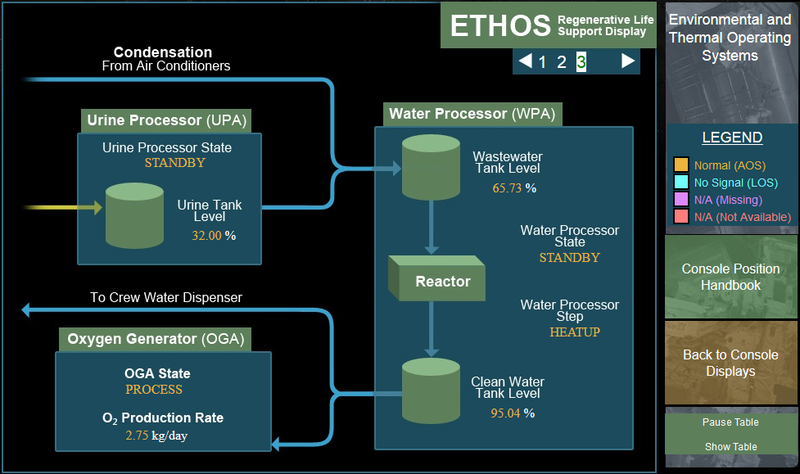 For example, click on ETHOS, which stands for Environmental and Thermal Operating Systems. You will see several metrics and indicators updated in real time through Lightstreamer. As shown in the screenshot below, in this moment the pressure of the Destiny Lab is 742.90 mmHg, with a temperature of 22.00 °C. The oxygen tank of the Quest Airlock has 6023.84 kPa pressure. 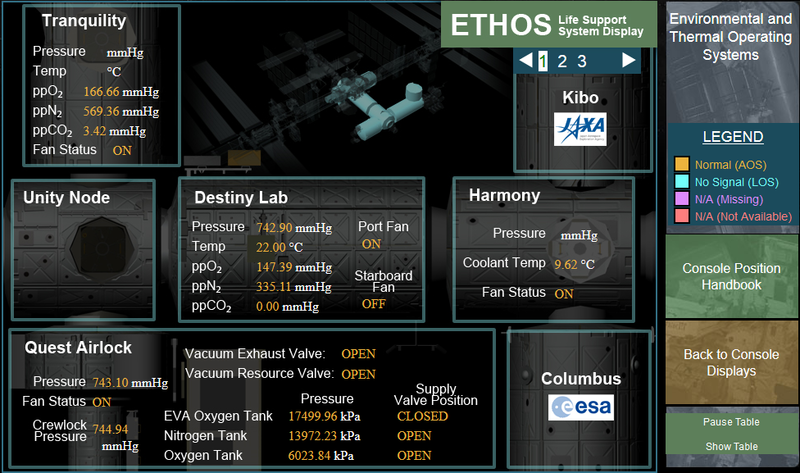 You can switch to display 2 of the ETHOS console to see further parameters, like all the details of the Air Conditioner. Now switch to display 3 and get ready for something apparently funny... Yes, any liquid is very precious in space and astronauts turn pee into drinking water. You can check out several other console displays, which is actually a very formative experience. Keep in mind that all the data you are seeing is not only real, but also real time, reflecting the actual state of the International Space Station at any moment. 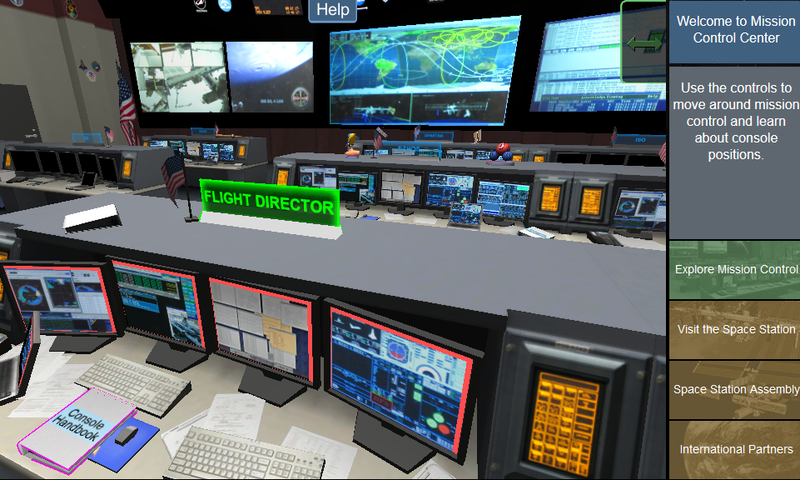 You can even take virtual 3D tours of the Mission Control Center in Houston, organized to describe how the mission control team supporting the ISS work. 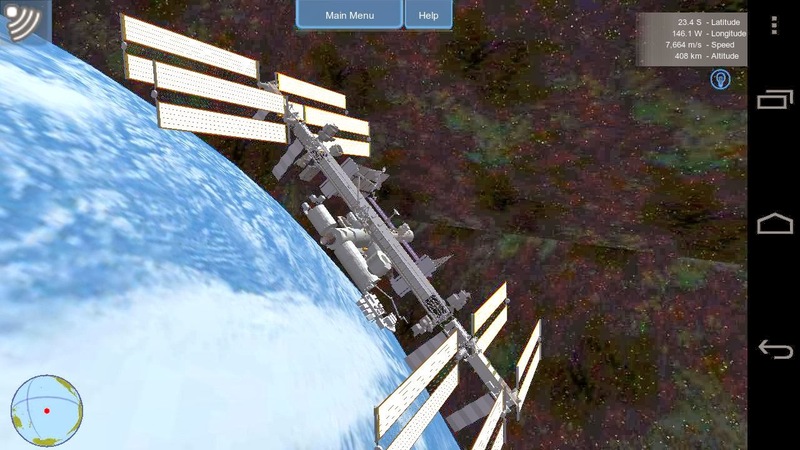 From the home page, choose Interact, then Explore Mission Control (the Unity plug-in is required for the 3D rendering; hopefully, somebody might want to port this to WebGL, to make a pure HTML5 experience). Move your mouse to look around and double click to move to a new position. You can click on the monitors to open any of the console displays explored above. All the features we enjoyed above are also available on native mobile apps NASA released for Android and iOS. International Space Station Live! or ISSLive! includes a website and mobile applications that tie ISS streaming systems data and operational timelines into one “Rich Internet Application (RIA)” experience. The application offers data on real time parameters such as station position, internal environment, altitude, payload rack science activities and other interesting data and crew activities. ISSLive! ties this data into an interactive application which includes the latest social media feeds. ISSLive! 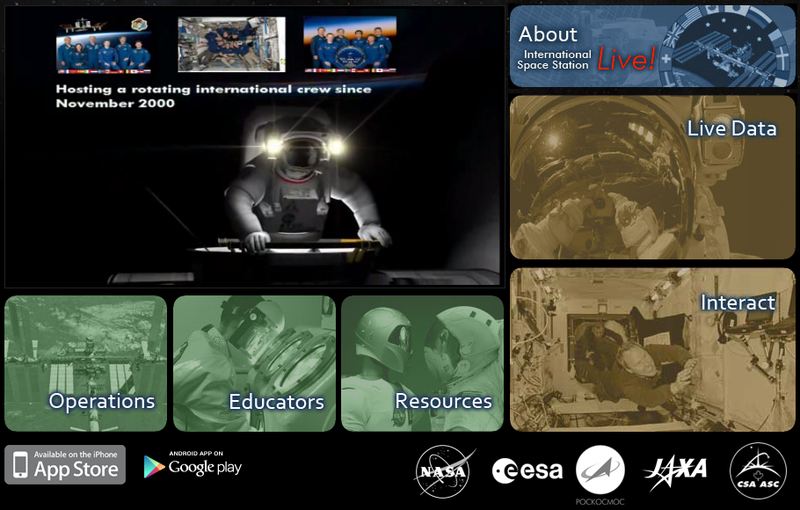 contains a scrollable timeline, with a ‘public-friendly’ view of crew and payload activities. It uses some of the latest interactive web content technologies, including 3D interactive virtual views of the MCC and ISS. ISSLive! is a “one-stop shop” for ISS data, letting users in on the fascinating activities that happen daily onboard the ISS. Working with the NASA Education Office, ISSLive! content serves as the basis for development of interactive lessons in the Science, Technology, Engineering and Math (STEM) fields. ISSLive! is also a resource for the space enthusiast, the educator, and the life-long learner to participate in the mission of the ISS." The International Space Apps Challenge is an international mass collaboration organized by NASA and focused on space exploration that takes place over 48-hours in cities around the world. The event embraces collaborative problem solving with a goal of producing relevant open-source solutions to address global needs applicable to both life on Earth and life in space. 2015's Space Apps Challenge had over 25 challenges in four areas: Earth, Outer Space, Humans and Robotics. "The International Space Station continuously provides data to ground systems in the form of telemetry. Telemetry is processed at NASA’s Johnson Space Center Mission Operations, where select telemetry is broadcast for public consumption. How in the world will you use this super awesome data stream from space? NASA has many telemetry clients running in Mission Operations centers across the United States, but can you come up with new and interesting ways to maximize usefulness on a real estate constrained mobile screen? Can you think of ways to leverage mobile and web technologies to handle notifications for space events? Create an app or other unique use. The app can be a clever new and innovative way to stretch the limits in the fields of HCI, UI/UX, HTML5 and mobile technologies. Can you think of novel ways to use the telemetry data to keep the public engaged with activities on ISS and other missions? These are just a few ideas as the sky is the limit for this challenge!" 26 projects participated in the telemetry Space Station Telemetry App challenge. In 2011, NASA's Undergraduate Student Research Program site published an interesting paper by Matthew Noyes and Robert Hirsh: Rendering Flight Telemetry in Platform-Independent Three-Dimensional Touch-Interactive Simulations. The paper describes an innovative project where Lightstreamer is used for pushing spacecraft telemetry data to tablet devices, which render a 3D representation of the vehicle in real time. "To explore new innovations in 3D graphics for engineering, a new data-driven simulation mechanism was created. This system uses flight telemetry to model vehicle state as a three-dimensional simulation for both standard platforms (PC and Mac) and iOS mobile devices (iPhones, iPads, and iPod touches). The data-delivery system is compatible with any mission using the Integrated Test and Operations System (ITOS) developed at Goddard Space Flight Center, with only slight modifications to the renderer required. The communication center forwards ITOS telemetry to the Mission Control Center, where it is republished via a Lightstreamer data adapter. Lightstreamer is a push service, refreshing live data as soon as new values are available. If data are not updated in a single refresh cycle, they are not forwarded to the client, reducing network bandwidth. This makes Lightstreamer ideal for scalable data delivery. A summary article is available on IEEE Computer Society. Some comments we made at that time are available on our blog. "After over 50 years of operation, NASA is about to permanently enter the world of instant (or near instant) information exchange with the general public in a new way that largely symbolizes one of the changing ways the premiere US space agency will interact with the public and disseminate information about science operations and real-time orbital operations on the International Space Station." "Lightstreamer has been procured by NASA Mission Operations Directorate via Lockheed Martin and is been evaluated for distribution of real-time spacecraft telemetry data".